Above: Felix Wong with wife and daughter. Felix Wong’s (黃日華) wife, Leung Kit Wah (梁潔華), was suspected of being diagnosed with leukemia after entering the hospital at the end of November due to constant fevers. Insiders revealed she had undergone chemotherapy for more than a month now and has lost much weight and hair. According to reporters, Felix and Chi Ching visited Leung Kit Wah in Hong Kong Baptist Hospital for two hours each night regardless of their busy schedules. Allegedly, they never informed their friends and colleagues about Leung Kit Wah’s situation. At work, Felix maintained a joyful mood and appeared cheerful despite his worries. 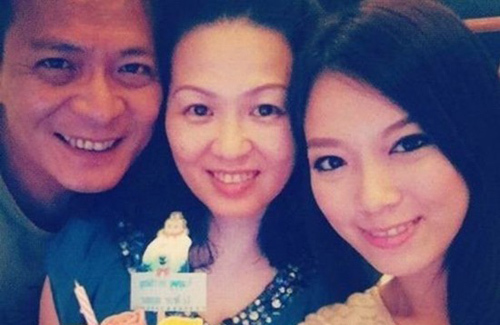 Even close friends, Michael Miu (苗僑偉) and Jamie Chik (戚美珍), were unaware of his wife’s health condition. This explains why Felix is suddenly so quiet. Yup…hopefully this also means that the tabloids can stop dragging Felix’s name through the mud with the whole HKTV issue, since if this report about his wife being ill is true, of course he’s going to spend his spare time taking care of her rather than being concerned about HKTV’s future. Hope Kit Wah is ok and wish her a speedy recovery. Best wishes also to the entire Wong family and hope that the tabloids leave them alone during this time so they take care of whatever they need to do. yeh wish wah gor family many lucks and recovery soon. if it’s true, they deserve to have privacy and peaceful time. I hope Felix’s wife will get well! Hope Felix wife get well soon, best wishes for his family. Hope she gets well soon and the media should stop invading their privacy. Whatever reason that landed her in the hospital is personal if the family chose not to disclose, stop harassing them. I thought he said he doesn’t have to work anymore because he saved up money when he used to work? i thought I WAS STARING AT Christine kuo ! Oh pls. Christine looks better than her. It’s a sad thing when sickness strikes any member of a family. Yes, it’s a private affair and people should respect their privacy. Hope Kit Wah recovers from whatever illness she’s suffering. My sincere wishes to the whole family. I agree and health is just so important. I hope she does not have a serious illness and will recover soon. Best wishes to Felix and his family. I must say that his wife looks ill in the above photo.